Thursday 16 March was the date of our International Speech Contest and what a great evening it was. There were inspiring speeches, insightful evaluations and entertaining Table Topics. The meeting was ably led by our Contest Chair, Dave Henson. Our first speaker was Richard Green with a speech titled “On the Crest of a Wave”. This was an inspiring speech about how Richard’s life was changed by meeting a soldier, who had suffered life-changing injuries in Afghanistan. The soldier’s cheerful attitude inspired Richard to change his outlook on life. The second speaker was Richard Murray who inspired us all to work towards our DTM Award. He encouraged us to film ourselves practising our speeches and so that we can look for ways to improve. The third speaker was Susan who shared some entertaining stories with us about her childhood and finished them off with some good advice for us. After the break our mystery speaker, Paul Cave from Purley Speakers, told us about his addiction to smoking and how he has given it up after thirty years. 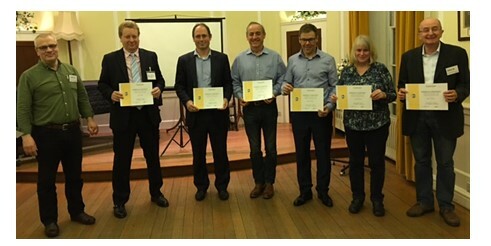 His speech was then evaluated by Richard Green, Richard Murray, Paul Lynch, Jenny Andreas, David Wilson and Alex Clark. In between all that our chair, Dave H, managed to fit in the Contestant Interviews and several Table Topics. The evening was finished off by giving a Certificate of Participation to all the contestants followed by giving Certificates to the Winners. Thanks to all the contestants, judges, contest chair and everyone else who took part and who helped to make this an inspiring evening. Please come along and support our winners at the Area Finals, which will be held at The Quaker Building, 60 Park Lane, Croydon, CR0 1JE, which is located at the south-west corner of the Croydon flyover, near to Fairfield Halls. The date is Saturday 25 March at 12.45 pm. So, please come along and support them. The contest is being organised by Purley Speakers, who are still looking for volunteers to be judges and to take on other roles. If you would like to help please ring or send an email to the President of Purley Speakers, Vidhya Nagendran. Our first meeting of March was opened by our Sergeant at Arms, Neil Pettigrew, who then handed over to our President, Paul Andreas. 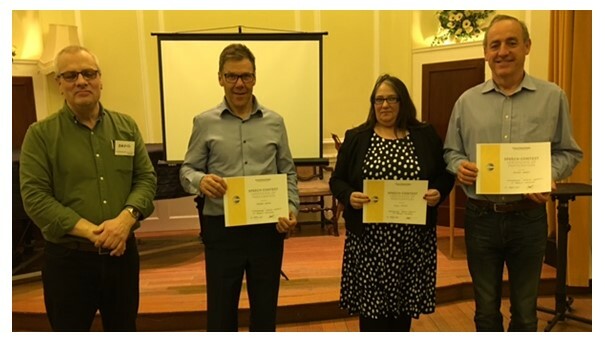 Paul reported on the very successful Speakathon of the previous week, when six of our newest members were able to give speeches. Carrie, Alexanderz, John, Juan and Daniel gave their Icebreaker speeches and Oscar presented Speech # 5, an interesting story about the scientist, Nikola Tesla. The standard was high and the stories were interesting and entertaining. Then Richard M announced the creation of a new committee, “The Nominations Committee”, and encouraged members to join it. Its role will be to oversee the election of the new Club Committee, which will take place during the first meeting of May. At the meeting prior to that, on 20 April, The Nominations Committee” will make a report of any nominations received. Our VPM, John, then encouraged us to stand for the Club Committee and especially to stand for his role of VPM, which he then went on to describe. Our Toastmaster for the evening was Riyah, who introduced her team to us comprised of Timekeeper – Alain; Ah Counter – Martin Langdon; Grammarian – Christine; Warm up – Annelise; Hot Tip – Martin Austin. Annelise led the Warmup by asking members to share what things they did to keep fit, which got some interesting replies. For example, Richard G said that he raised weights whilst Susan said that she raised glasses. Our first speech was by Jennifer A, with Speech # 4 from the CC Manual, titled “Nothing Ventured, Nothing Gained”. She described her adventurous daughter, Ruth’s attempts to ski for the first time in the Swiss Alps, which resulted in a sore bottom and nearly getting marooned at the top of a mountain. Our second speech was by Neil with a speech called “The Poor Relation”, which exhorted us to complete our “Competent Leader Manual” and gave us some compelling reasons why we should. The third speech was by Richard M with Speech # 4 from the CC Manual called, “Choose Love Over Comfort”. The three speeches were then ably evaluated by John C, David H and Richard G respectively. Then onto the Awards. Alexanderz won the Table Topics award, Richard G won the Best Evaluation Award for his evaluation of Richard M’s speech and Richard M won the Best Speaker Award. Dave Henson then reminded everyone about our Club Contest, which will be held at our next meeting on 16 March and announced that we still have slots for speakers and evaluators. Paul A then drew the meeting to a close. A big thank you to all those who took on roles and gave speeches and helped to make the evening a great success. A visitor from another club told me afterwards that she thought the standard of all our speakers was very high! Our next meeting will be held on Thursday 16 March, which will be our contest.